Experience a taste of Dubai’s finest luxury at the Jumeriah Al Qasr hotel, which is part of the award winning Jumeriah Madinat resort. The hotel is styled like a sheikh’s summer palace and boasts 294 decadent rooms and suites designed with traditional Arabian décor. 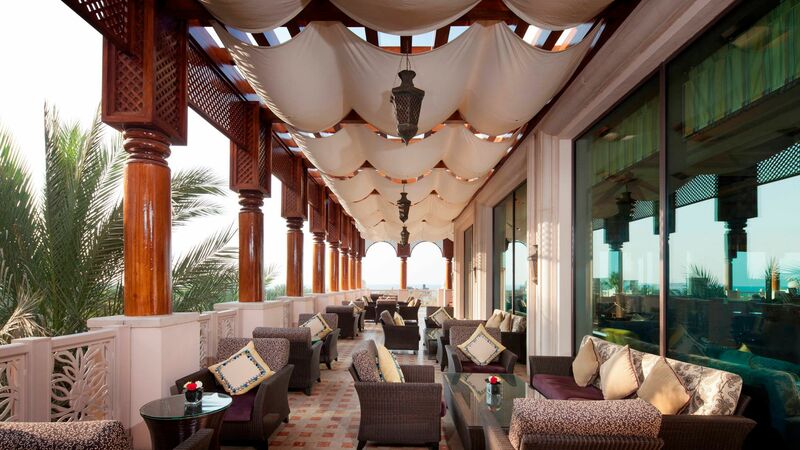 Take in views over the gardens and Arabian Gulf from your private terrace. Guests have access to all the resort’s facilities, connected by waterways which you can navigate on a rustic Abra boat. There are five pools, two grand ballrooms, five tennis courts, a spa and fitness centre. Down at the two kilometre long private beach you can try some water sports and relax in the sun. 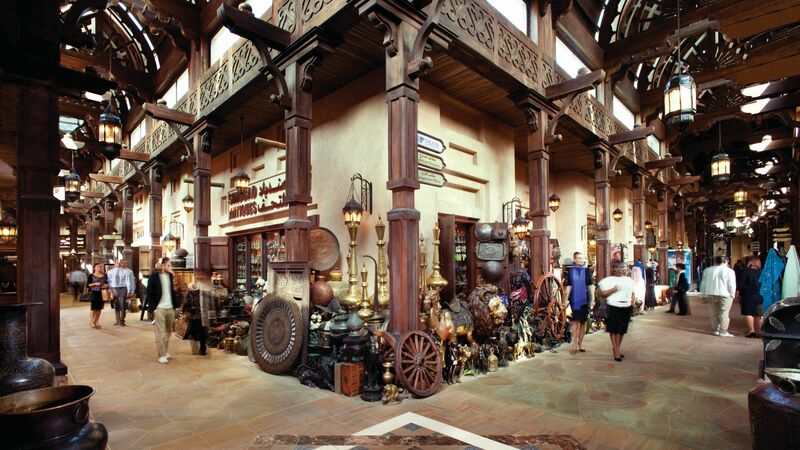 Shop at the onsite souk, which has 95 boutiques. Children will love the world class Kids’ Clubs and nearby Wild Wadi Waterpark, which guests have complimentary access to. There’s a staggering array of dining options, with 40 restaurants and bars spread across the resort and serving a range of local and international cuisine. A range of hotel child prices are available for ages 0–3 and 4–11 years. Located at Al Qasr, the Al Fayrooz Lounge offers delightful afternoon tea to its guests with the option to sit on the terrace overlooking the famous Burj Al Arab. Al Hambra is a fantastic, traditional restaurant offering the very best in Spanish cuisine from tapas to paella. 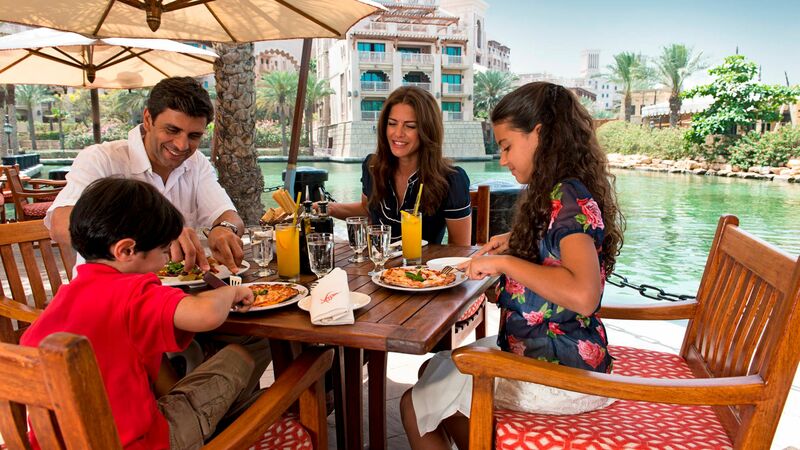 There is also the option of dining al fresco, enjoying views of the palm-fringed canals and boats sailing by. Open: Lunch 12:00 - 15:00 (Except Friday) Friday Brunch 12:30 - 16:00 Dinner 19:00 - 23:30. If you feel like a decadent breakfast or afternoon tea, head to Al Samar Lounge. Choose from a selection of sandwiches, cakes, savoury scones and light dishes served with a wide choice of teas, coffees and alcoholic drinks. Open: 06:30 - 00:45, with high tea from 14:30 – 18:00. Arboretum has a menu of Arabian classics, as well as international dishes. Dine al fresco on the terrace with sea views or relax inside. 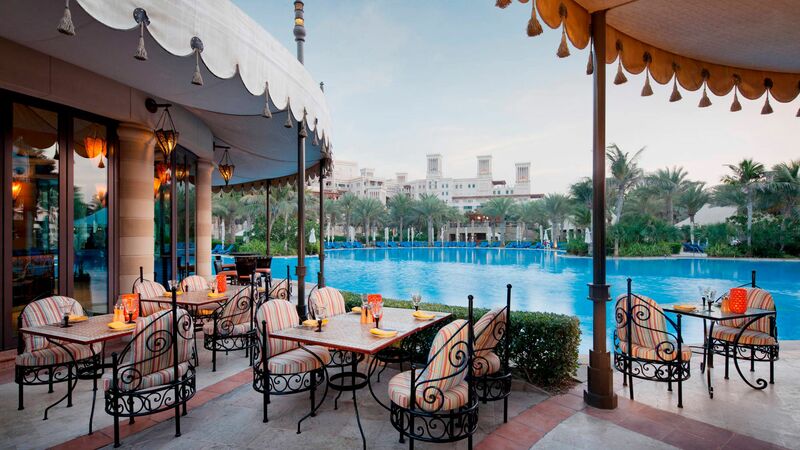 There’s an excellent Friday brunch option, which has been rated one of the best in Dubai. Open: 06:30 – 11:30, except Fridays when it closes at 10:30. Lunch is available from 13:00 – 15:30 every day except Friday, when brunch is served from 12:30 – 16:00. 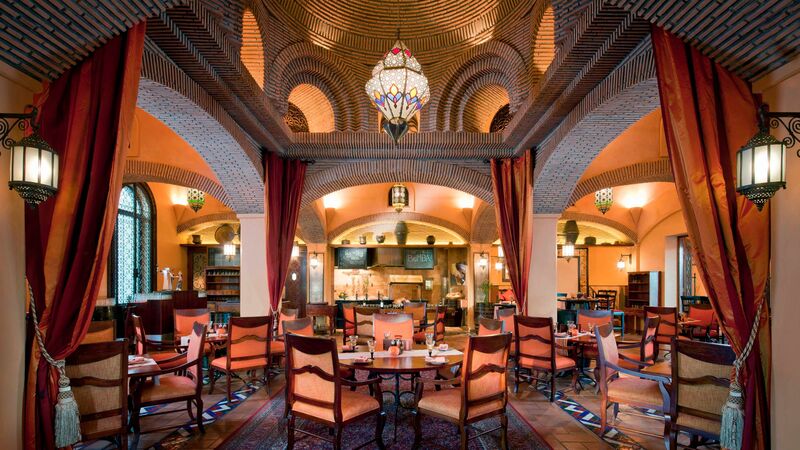 Khaymat Al Bahar has a menu of Lebanese dishes, including desserts and drinks. 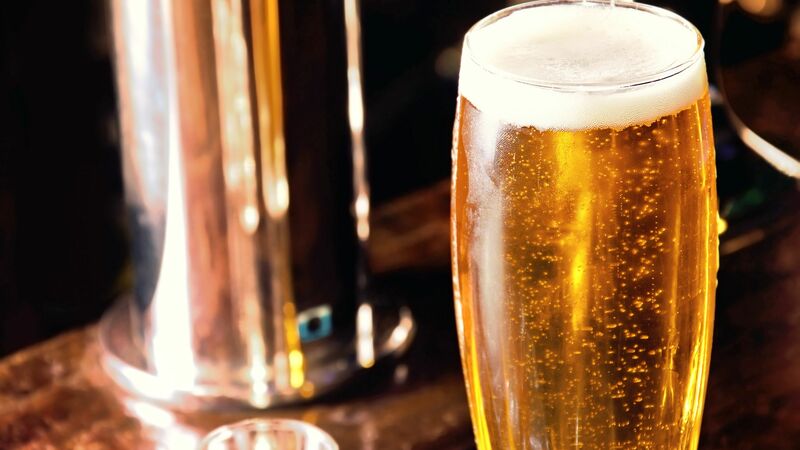 There’s live music in the evenings to keep you entertained, as well as belly dancing. Open: 13:00 – 16:00 Saturday to Thursday and 19:00 – 23:30 every day. The Hide is the Madinat's American Steakhouse is a great place to enjoy a selection of fine meats, accompanied by a great selection of American and other New World wines . 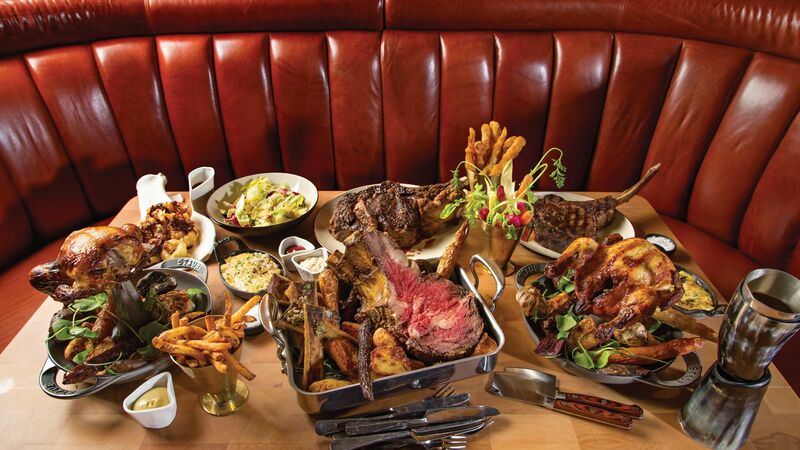 Guests can enjoy meats such as prime rib, Australian wagyu, and ribeye in a trendy and relaxed atmosphere. 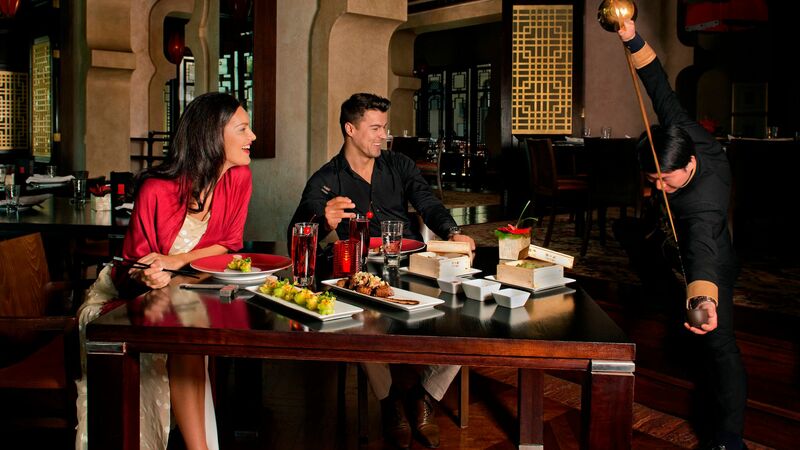 Pai Thai is a multi award winning restaurant set over the waterways of the Jumeriah Madinat resort. The menu features delicious Thai classics such as prawns with red curry sauce and Pad Thai, served in a sophisticated setting. Open: 12:30 – 14:45 and 18:00 – 23:15. Located at Souk Madinat Jumeirah, the Perry & Blackwelder's Original Smokehouse is a fun, American themed restaurant serving a variety of BBQ dishes from the deep south from slow smoked Mesquite brisket to applewood-smoked turkey breast. Located at Al Qasr, Pierchic is a Mediterranean seafood restaurant offering an à la carte menu with a fine selection of oysters, sashmi, scallops, lobster and fresh fish. The restaurant is located at the end of a pier overlooking the Dubai coastline, Palm Jumeirah, Arabian Gulf and the Burj Al Arab. Open: 12:30 - 15:00 and 18:30 - 23:30. Located at the Mina A'Salam, Shimmers is a wonderful beachfront restaurant serving light Greek cuisine for both lunch and dinner with views of the Burj Al Arab. Open: 12:00 - 16:30 and 19:00 - 23:30. The Noodle House is located at Souk Madinat Jumeirah and is a fun and relaxed restaurant serving delicious Asian cuisine such as Bao, Laksa and Pad Thai. Come to Zheng He’s for oriental cuisine with a modern twist. The restaurant is inspired by the historic Chinese explorer, with a menu featuring classic Chinese dishes with a contemporary edge. Open: 12:00 – 15:00 and 18:30 – 23:30. This popular eatery is set on the waterfront in the Jumeriah Madinat Souk and serves traditional Italian cuisine, perfect for all the family. Located amongst the waterways of the Madinat Jumeirah, Segretto Restaurant & Bar offers the finest in Italian delicacies. 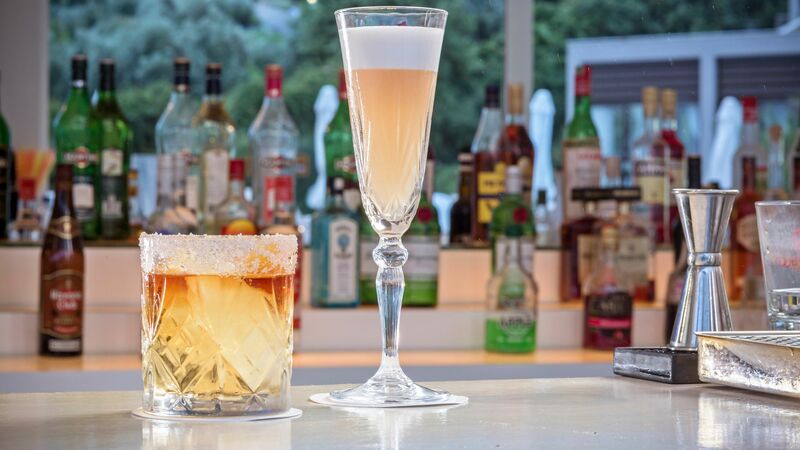 Expect pastas, risottos and fresh-caught fish dishes, accompanied by classic Italian cocktails and wines. Relax on comfy sofas with views of the Burj Al Arab while you sip on an innovative cocktail at this trendy bar. Koubba is a great place for sunset drinks, with themed cocktails and a live Jazz, Soul and R&B music programme after the sun goes down, as well as a light food menu. Open: 17:00 – 03:00 (except Friday) Friday 16:00 - 03:00. Jumeriah Madinat Al Qasr’s guests have full use of the resort’s five impressive pools, which are set in lush tropical gardens with comfortable loungers. Kids have a dedicated pool and there’s another one for adults only with a swim-up bar. You can enjoy beach views from many of the pools. The resort has its own private beach, a mile long stretch of soft sand lapped by turquoise water. You can order food and drinks directly from your sun lounger while taking in views of the ocean and iconic Burj Al Araba, one of the tallest hotels in the world. The Jumeriah Madinat also has a water sports centre, which offers everything from kayaking and banana boat rides to kitesurfing. 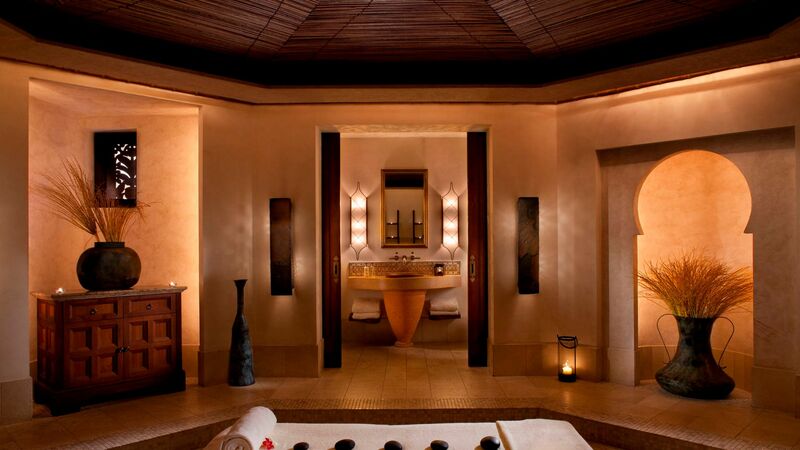 Don’t miss a dose of pampering at the sumptuous Talise Spa, which is listed in the World’s Best Hotel Spa Brands. There are 26 treatment rooms, including three couples’ suites where you can indulge in a massage, facial or body treatment. Therapists are all expertly trained and can tailor treatments to your needs. Take advantage of the relaxation areas, plunge pools, steam rooms and infra-red sauna. Guests under 16 must be accompanied by an adult at the spa. 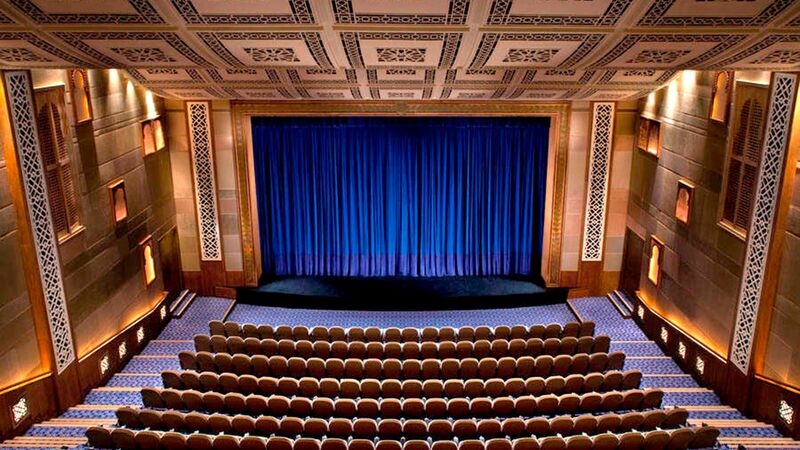 The Madinat Theatre is a venue that hosts a variety of entertainment from live performances, stand-up comedy, ballet and musicals throughout the year. Guests receive complimentary access to the nearby Wild Wadi Waterpark, which has over 30 slides and attractions. 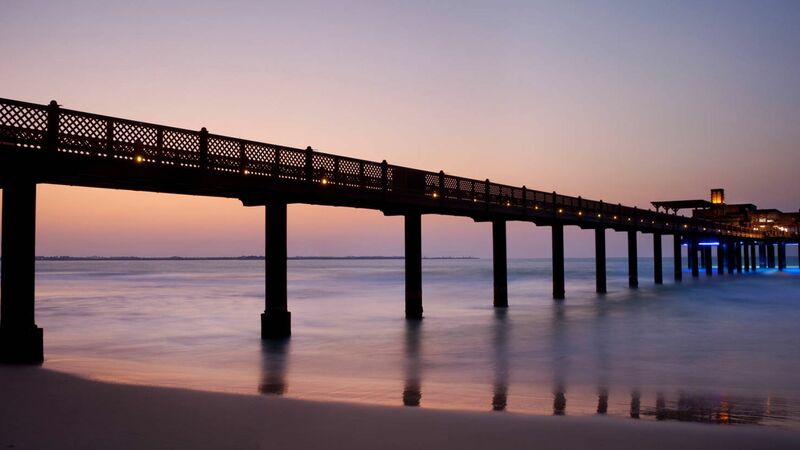 Jumeirah Madinat Al Qasr is located in Dubai’s Jumeirah Beach resort, which is just minutes from the city centre by monorail. 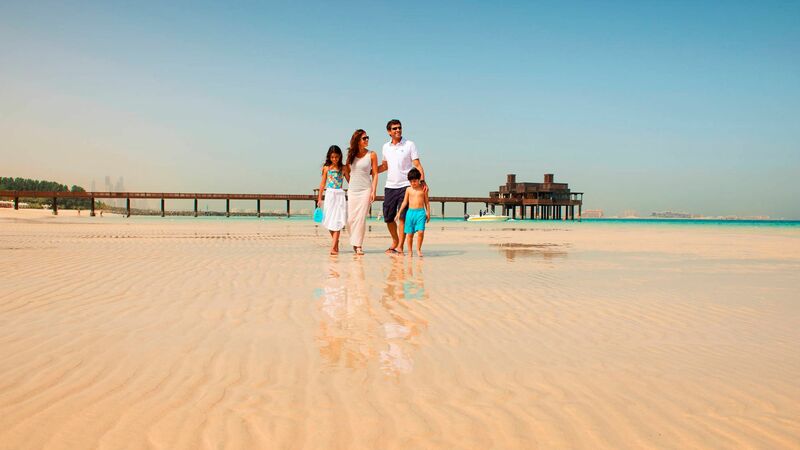 This exclusive area of the city is home to glorious white sandy beaches which overlook the clear waters of the Arabian Gulf. Enjoy a range of water sports, or simply spend your days enjoying lounger service on the beach. Wild Wadi Waterpark is under 10 minutes’ walk from the hotel, as is the Turtle Rehabilitation Project, both providing excellent day trips and outings for families. Surrounding the beach are excellent restaurants serving global cuisine, as well as rooftop bars where you can look out over this majestic area. 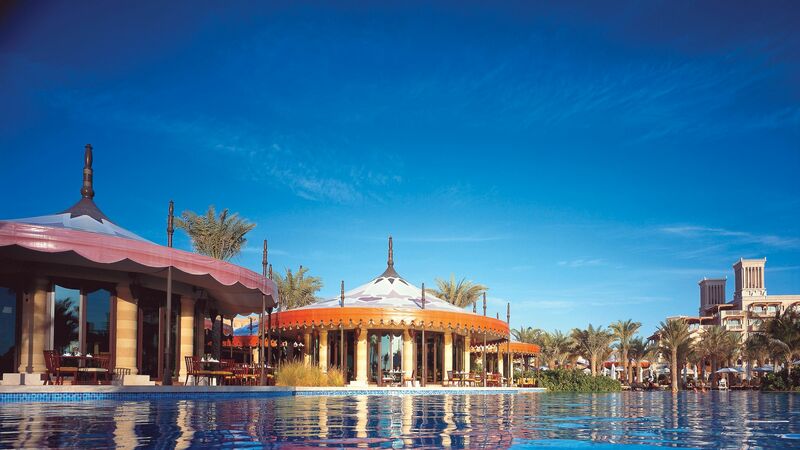 Jumeirah Madinat Al Qasr is 30 minutes from Dubai Airport. Arabian Deluxe Rooms are elegantly designed and feature antique furnishings to create a stylish and opulent retreat. Guests can enjoy their own private balcony with views of the resort's waterways, gardens and pathways. Deluxe rooms also have a dressing area and an Arabian style bathroom with a marble bathtub. Ocean Deluxe Rooms are stylish in design and feature antique furnishings and a private balcony offering views of the Azure Sea and lush gardens. Deluxe rooms feature opulent marble bathrooms, ample amounts of wardrobe space and dressing area. These rooms are the same as the Arabian Deluxe Rooms but with premium leisure benefits which include; Exclusive check-in and reception area, children's purpose built playroom and computer room, upgraded bathroom amenities, unlimited access to the private lounge with all day tea, coffees and soft drinks, afternoon tea and light refreshments between 15:00 - 16:30, pre dinner drinks and canapés in the lounge between 18:00 - 20:00 and late check-out based on availability. These rooms are the same as the Ocean Deluxe Rooms but with premium leisure benefits which include; Exclusive check-in and reception area, children's purpose built playroom and computer room, upgraded bathroom amenities, unlimited access to the private lounge with all day tea, coffees and soft drinks, afternoon tea and light refreshments between 15:00 - 16:30, pre dinner drinks and canapés in the lounge between 18:00 - 20:00 and late check-out based on availability. These rooms are the same as the Arabian Deluxe Rooms but with club executive benefits which include; Upgraded bathroom amenities, unlimited access to the private lounge with all day tea, coffees and soft drinks, afternoon tea and light refreshments between 15:00 - 16:30, pre dinner drinks and canapés in the lounge between 18:00 - 20:00 and late check out until 14:00 based on availability. These rooms are the same as the Ocean Deluxe Rooms but with club executive benefits which include; Upgraded bathroom amenities, unlimited access to the private lounge with all day tea, coffees and soft drinks, afternoon tea and light refreshments between 15:00 - 16:30, pre dinner drinks and canapés in the lounge between 18:00 - 20:00 and late check out until 14:00 based on availability. Junior Suites are elegantly designed and offer luxury and comfort with a king size bed, goose-down feather bedsheets and oversized pillows. The suite offers plenty of space with a living area and a large furnished private balcony or terrace. The bathroom boasts a marble bathtub, walk-in shower and luxurious bathroom amenities. Junior Suites are elegantly designed and offer luxury and comfort with a king size bed, goose-down feather bedsheets and oversized pillows. The suite offers plenty of space with a living area and a large furnished private balcony or terrace with views of the ocean and resort. The bathroom boasts a marble bathtub, walk-in shower and luxurious bathroom amenities. The One Bedroom Arabian Suite is a luxurious retreat decorated in traditional and rich colours of the Middle East. The suite is spacious with a separate bedroom to the living area and boasts resort views of the gardens and waterways. The bathroom has a marble bathtub and separate walk-in shower. Returned yet again to our favourite hotel, the rooms have received a major refurbishment, making them brighter and a more modern feel whilst retaining an Arabic theme. There are a number of reasons we frequent this hotel so often, but namely the staff. from being collected at the airport to arriving at the hotel we simply feel we have arrived home, the staff even say welcome to your second home. The luggage guys greet us with a warm smile and friendly greeting and remember our preferences for which bags are attended too and those that they leave with us. The front door men are always very friendly and efficient, James and Herbert always go out of their way to assist us at every opportunity when they see us outside the hotel. I?? ?ve written before that a few staff have recently left Al Qasr for personal reasons, the replacement staff have huge shoes to fill be seem to be making the grade. I understand Manju had returned to Jumeirah and we hope to catch up with him in his new hotel on our return to Dubai. We were looked after in club executive by the very capable Braian and his team including Mr club lounge himself Amjad who always makes our stay very pleasant and friendly without being too formal. Every request from the club lounge team was dealt with efficiently and with back up email responses to confirm bookings for restaurants etc, even managing to get us booked into really busy venues both in the Madinat resort and externally. The chefs in the club lounge looked after our breakfast requirements at a level not often seen, don?? ?t be put off by the lack of breakfast food on show, let the chef know your requirements and they won?? ?t let you down (well not in my experience anyway or the number of friends who?? ?ve stayed with us). Chef Janika always ensures we are well looked after and he enjoys seeing your delight as he presents you a freshly made item. The club lounge is a real asset to the hotel, from breakfast through to afternoon tea and on to cocktails and canap? ?s in the evening the staff are all very attentive and make our stay all the better. On the bar Wai and Santosh have really come in to their own and Santosh has relaxed and communicates much better with the guests. Service on the beach was excellent as always, the food on the beach is really good with a good variety of dishes on offer. We would prefer an adult only section of the beach but this isn?? ?t that much of a problem, we did hear their were possible plans for a pool refurbishment and maybe an adult only pool (not confirmed). The restaurants are plentiful and as creatures of habit tend to stay with our favourites, however we have ventured to a couple of the new places in Al Naseem, I do feel that Al Qasr needs at least one more flagship restaurant just to boost its presence. Pier Chic and Pai Thai are both consistently very good as is the Hide. Al Fayrooz Could really up its game and become the real flagship place to eat, not there?? ?s anything wrong, but what a setting that could be put to (in my opinion) much better use. Our room was equally as clean as it always is and well stocked with bathroom amenities and fresh flowers from the hotel management welcoming us back. Haytham Mounir Made contact throughout our stay ensuring all our requirements were met, Haytham Takes his job seriously but he has a very warm nature towards his guests. Another great stay and one of them best hotels there is. Excellent experience as always, 5 stars, with Nash!! Good quality dishes, and excellent service. Beautiful place! Variety of foods to choose from and all fresh and well prepared. And from so many different continents! Excellent brunch. Huge selection of food, all excellent quality. 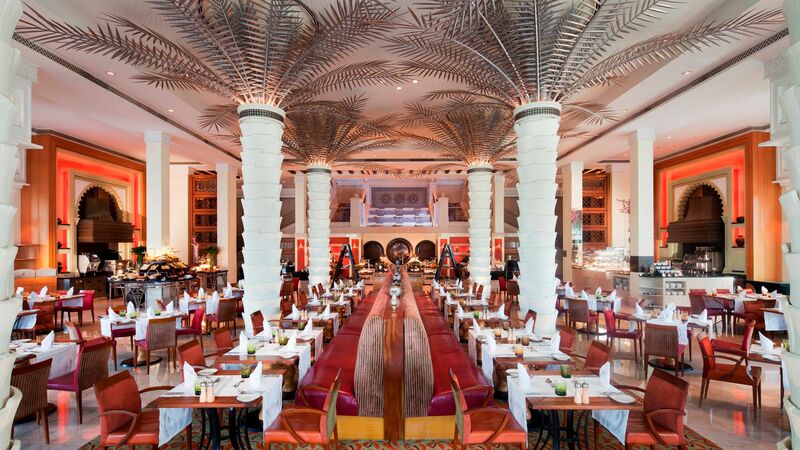 Great service and fantastic location overlooking Madinat Jumeirah Oasis and Burj Al Arab. Live music. Loads of couples and families of all ages here. Smart casual dress.